After receiving my copy of iLife ’08 I began playing with iMovie ’08. Despite the controversy surrounding iMovie 08 vs iMovie HD, I find the skimming UI Apple has introduced quite good. IMPORTANT: this code only seems to perform well with movies encoded using the Apple Intermediate codec. 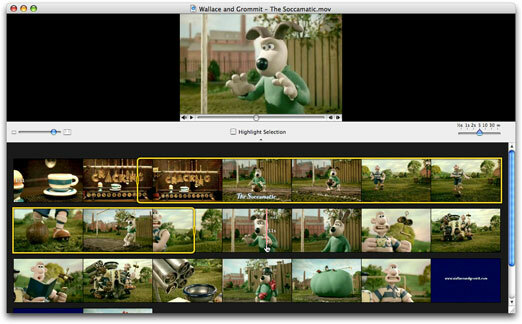 LNSQTSkimmerView relies on QTMovie‘s frameImageAtTime: method to display thumbnail frames. This method can become very slow for movies encoded in other formats (i.e. H.264). iMovie ’08 uses the Apple Intermediate codec and also pre-generates thumbnails for its skimming view. Pre-generating thumbnails may allow my code to operate well with any QuickTime movie. This code uses the NSBezierPath+PXRoundedRectangleAdditions Objective-C category from Andy Matuschak’s Pixen project.